Tangy lime coconut cake with lip smacking buttercream lime frosting. 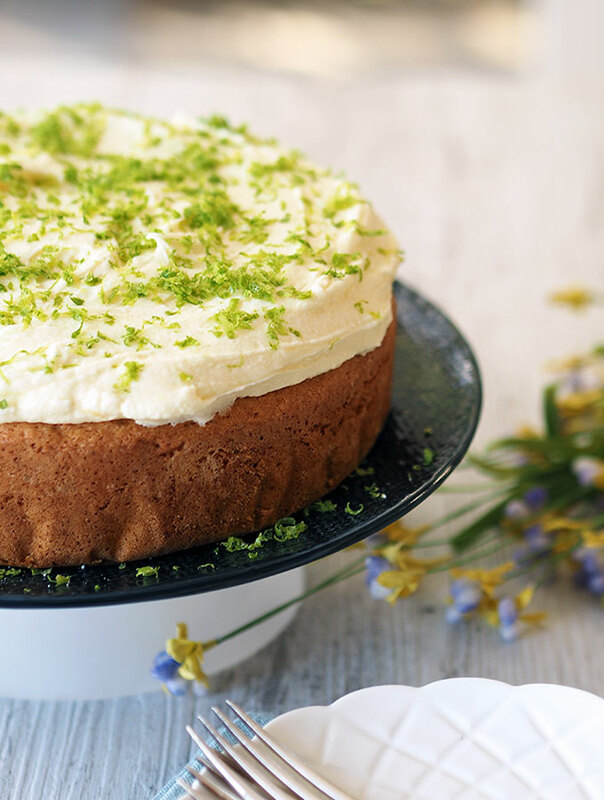 Moist and fragrant, decorated with lime zest for added zing and colour. 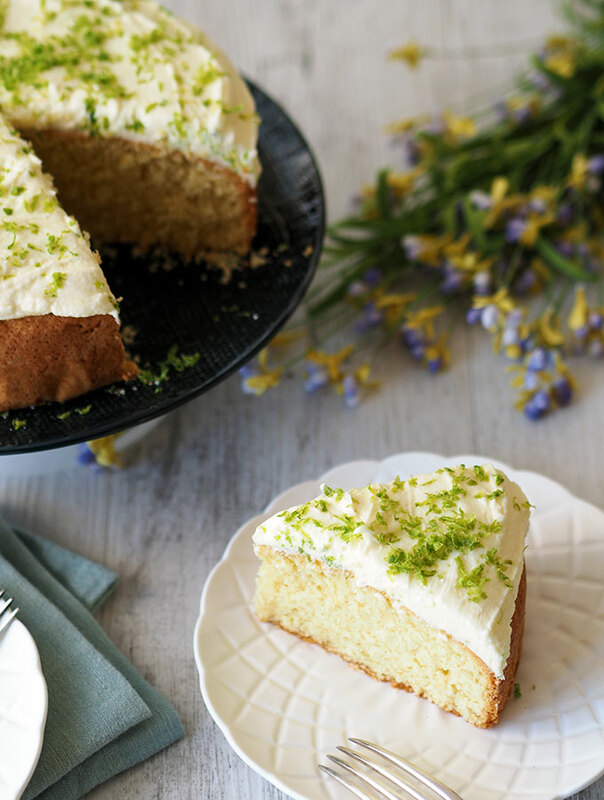 Tangy lime coconut cake, the thought of this cake just makes my mouth water. Lime and coconut are a fabulous combination. Not only tangy, this cake is also moist. Yes, I used that word, “moist”! 20% probably just cringed, apparently that is the percentage of people who hate the word. Why don’t people like using a perfectly acceptable adjective to describe food? It seems it reminds them of bodily functions. According to research, mainly young well educated women have an issue with “moist” (whoops I did it again). I’m old and cranky, therefore deem it an appropriate word when describing a cake. That is unless the cake is dry. This tangy lime coconut cake is not. I’ve underplayed the lime in the cake itself, the major tang factor comes from the frosting. Purely a personal choice, Mac’s diet doesn’t allow him to eat tangy food. My theory was he could remove the icing and all would be satisfied. The theory proved correct and we all enjoyed the cake. 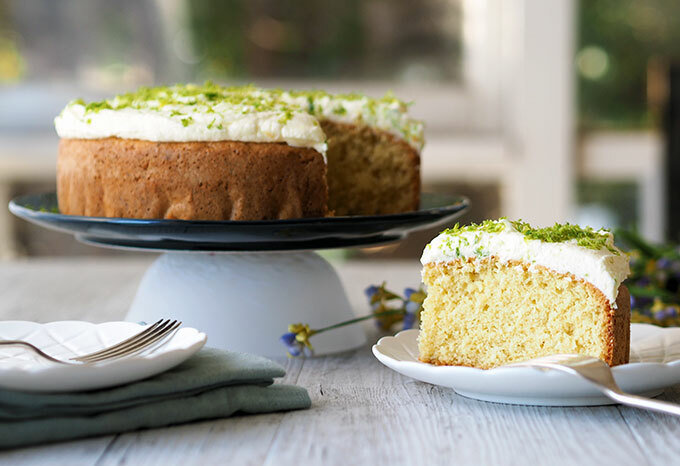 The lime zest in the cake adds a wonderful lime aroma and delicate taste, without the zing. If you require more tang in your tangy lime and coconut cake add some lime juice in to the cake batter when you add the coconut milk. Removing some coconut milk in order to still have ½ cup of liquid. Do tell does the word “moist” make the hairs on the back of your neck stand up? Or are you like me and find it an acceptable word in the English language? In a small bowl combine coconut and 65ml coconut milk. Mix well leave coconut to absorb liquid for half an hour. Pre heat oven 170°C ( 340 F°). Grease and line a 20cm/8 inch round cake tin. Cream butter, zest and sugar in a large bowl. Once pale yellow in colour add eggs one at a time. Scrape side of the bowl between each addition. Add half the flour and coconut milk, mix well and then add the rest of the flour. Place cake batter in greased and lined tin. Bake for 35 minutes or until cooked through and golden. Turn out on to a cake rack to cool. When completely cool ice with lime frosting and sprinkle with lime zest. To make the lime frosting: Beat butter until light and fluffy, continue beating while adding icing sugar and then slowly add lime juice. Hi. This cake sounds wonderful and I want to make it for a charity event, but I need to make it in advance, so my question is will th cake freeze ok ? Hi Carole, The non-iced, naked cake will freeze well. Wrap it in at least three layers of cling wrap/plastic wrap, making sure all air has been expelled. Do not freeze the cake with the frosting. You will need to ice/frost the cake after it has thawed. I wish there was some way I could upload the cake I made using your fabulous recipe. It was a HIT!! I could taste both the lime and coconut and the house smelt delicious whilst the cake was baking in the oven. Thank you so much for your wonderful comment, I’m so glad that you enjoyed the cake and that it was a hit. Reading amazing comments like yours bring a smile to my face and totally make my day! If you are on social media at all, upload it and tag me in @bellyrumbles, I would love to see your creation!. Hi there – do you use coconut milk from a can, or coconut milk in a tetra pack used as a substitute for cows milk? Hi Sophie, you can use coconut milk from eiher a can or tetra pack, whatever you normally buy. It isn’t a substitute for milk, it is what is in the recipe. You could use milk if yo uanted to give it a try, but I cant guarantee the cake with be the same, and it won’t be as coconutty in flavour. Hi Sara – I wasn’t sure if there was a difference between the two! We used a can and the cake has turned out beautifully! Can’t wait to taste it! Thanks! Another awesome Bellyrumbles recipe! 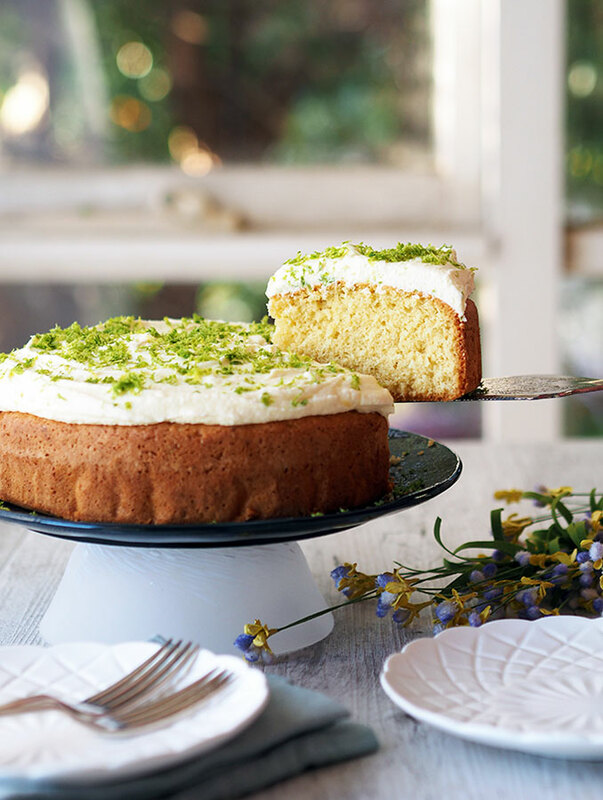 If summertime were a cake, this would be it. This looks SO darn good!! I am a little confused you say 1/4cup coconut milk then down further you say 1/2 cup coconut milk. So do I use 3/4 cup. Aldo you say 4 eggs beaten . Instructions day add eggs one at a time. Can you clarify this for me. Hi Shirley, apologies for confusing you. I have removed the word “beaten” from the ingredients list, that shouldn’t have been there. In regard to the coconut milk. As per the instructions, the 1/4 cup is used to soak the coconut. The remainder of the milk goes into the cake batter where stated. I hope that clears things up for you and that you enjoy the cake! The cake looks delicious! I love a coconut cake and I definitely think ‘moist’ has a limit to how many times it can be said without becoming weird ?? Haha! I don’t understand why people have a problem with saying the word moist when it comes to describing a cake, but I know they do. 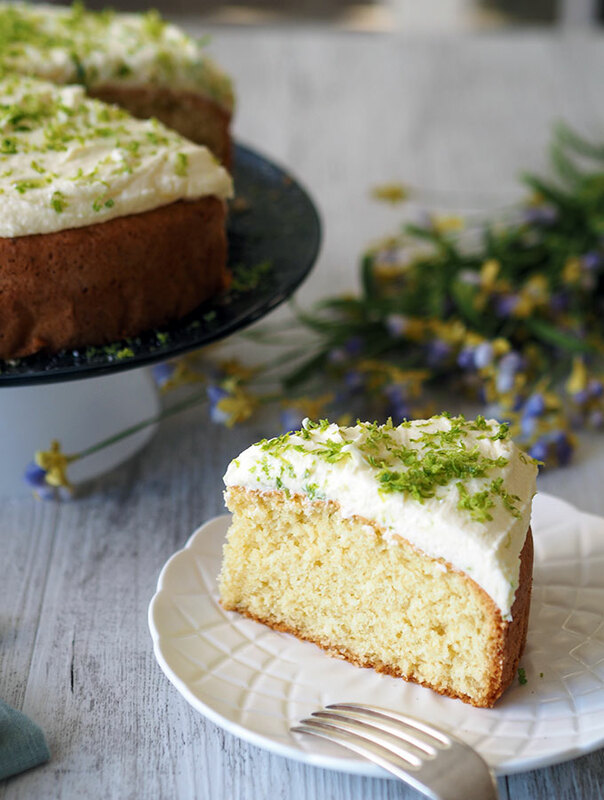 Love the combination of lime and coconut, so this cake is a winner for me! This looks so yummy!! I love a good cake and I like bringing a non typical one to the table! Thanks for sharing this! Your cake looks and sounds wonderfully good! Love the lime addition! Delicious cake! Can’t wait to try it!